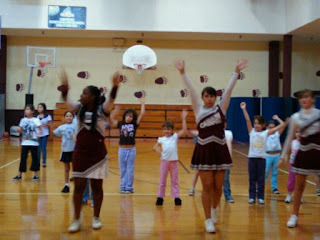 Here I am at my daughter's cheerleading clinic, without my camera. At least with my camera in my hands I am more likely to look through the viewfinder and pay attention to what's going on. I like to people watch, and take pictures. Especially of my daughter in action. Instead of doing that though, I'm tweeting and generally giving off an anti-social vibe. I'm not comfortable around these parents - for a variety of reasons, number one being I don't know a living soul here. I have no IDEA where my kids get their out-going personalities from. It's not from me! But I was thinking, "I'm tweeting, and looking up things for people online, and barely paying attention to what's going on in front of me. Why is it so hard to *be* present, in the present?" I know part of the answer is that I get bored easily when sitting still. Did I mention that these bleachers are hard on the bum??? I'm not all that interested in cheerleading either, but my daughter is, and she keeps looking at me, so I figure I should pay some sort of attention. Well, clinic will be over in an hour, let's see how much more attention I can pay. So cute. And yeah I have a hard time staying present. I think it's lack of brain power and a surplus of Mommy Brain! It's like my hormonal shift after pregnancy caused ADD. You know, I had that same theory. We have to track so much more after the kids are born ... and so easy to get distracted! She's performing tonight and I brought my DSLR. Hopefully I can get a decent seat for some good shots.